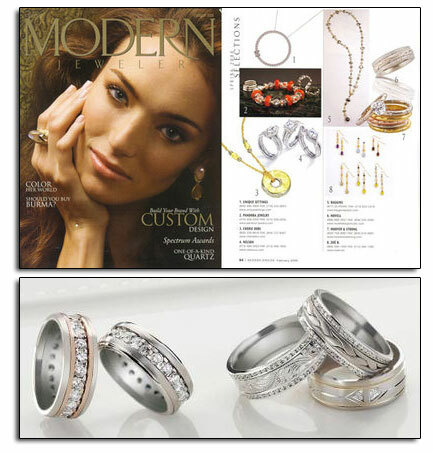 Argentium Sterling Silver wedding bands featured in Modern Jeweler. The February 2009 issue of Modern Jeweler included Novell Argentium Sterling Silver wedding bands (l. to r.) AS1977-9GEW, AS1974-8GEW, AS1971-9GEW, and AS1978-9GEW in the 2009 Spring Selections feature (on page 52). Argentium Sterling Silver wedding bands stay bright and beautiful for years. Argentium Sterling Silver is also harder than regular sterling silver, is affordable, does not tarnish and is easy to clean. Learn more about Argentium Sterling Silver. 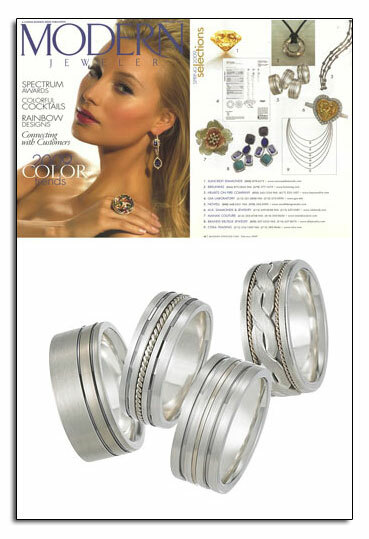 Argetium Sterling Silver wedding bands as featured in a leading jewelry trade publication. Argentium Sterling Silver wedding bands in Modern Jeweler. The July 2008 issue of Modern Jeweler featured brand new Novell wedding bands that are manufactured using Argentium Sterling Silver and 18kt gold. This product was recently introduced at the 2008 JCK Show in Las Vegas. 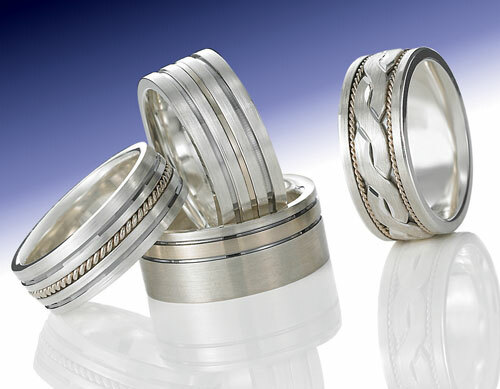 The wedding band styles are (from left to right) – AS1974-8GEW, AS1971-9GEW, AS1977-9GEW and AS1978-9GEW. The article also features comments about the metal from Novell’s Bruce Pucciarello. Download the Modern Jeweler article. View the product video featuring Argentium Sterling Silver wedding bands. Argetium Sterling Silver wedding bands as featured in a Modern Jeweler article. Palladium wedding bands in Modern Jeweler. The June 2008 issue of Modern Jeweler featured Novell palladium wedding bands L1102-8GCC (23 x .10 diamonds), L1103-7.5GCC (23 x .10 diamonds) and L1106-8GCC (23 x .10 diamonds). Download the Modern Jeweler palladium wedding band feature. Need help with choosing the right metal for your wedding band? View the “Choosing The Right Metal” video brochure. Or download the “Choosing The Right Metal” brochure. 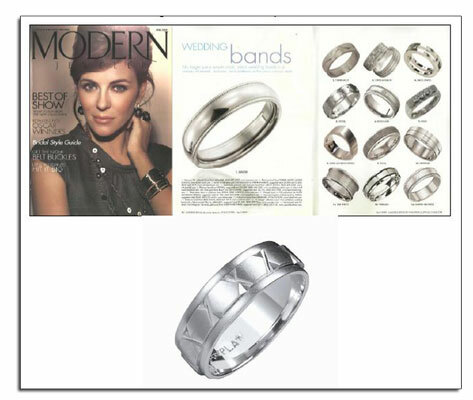 Palladium wedding bands featured in Modern Jeweler. Platinum wedding bands in Modern Jeweler. The March issue of Modern Jeweler featured Novell platinum wedding band styles PE2347-LA, and P1892-3LCC in the supplement Promise: A Retailer’s Guide To Bridal Jewelry. Download the Modern Jeweler platinum band feature. 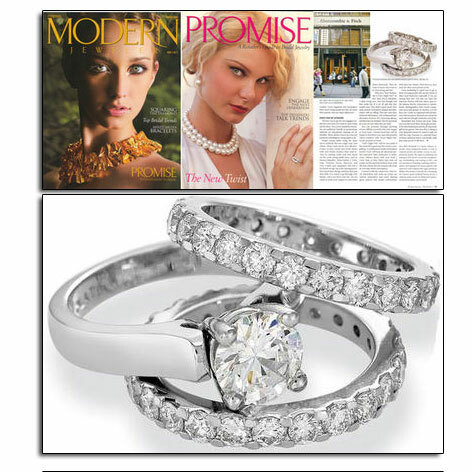 Platinum wedding bands and engagement ring featured in Modern Jeweler. 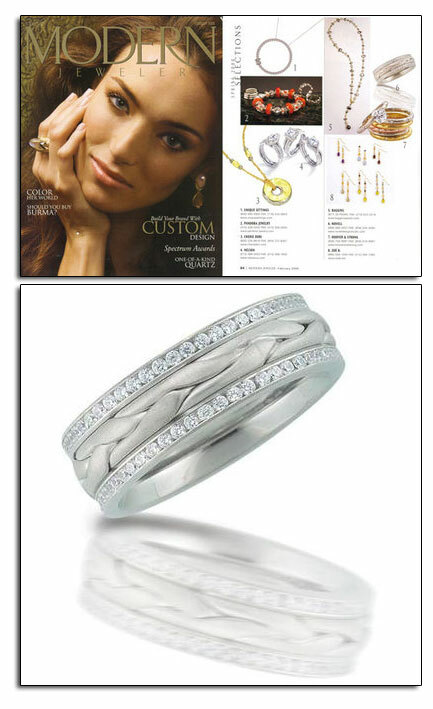 Braided palladium wedding band in Modern Jeweler. 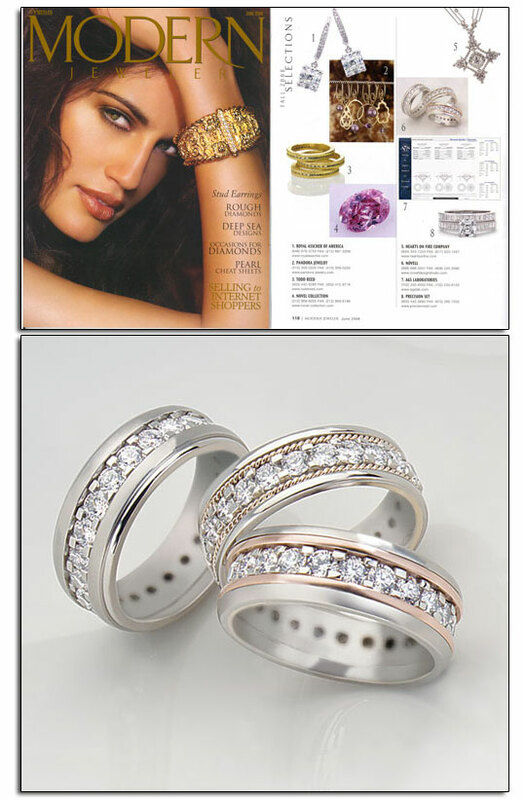 The February 2008 issue of Modern Jeweler featured Novell palladium wedding band L1110-7GCC on page 64. Download the Modern Jeweler editorial feature. Palladium wedding band in Modern Jeweler. Palladium wedding bands with diamonds in Modern Jeweler. The February 2008 issue of Modern Jeweler featured Novell palladium wedding bands (l. to r.) L1106-8GCC, L1102-8GCC, L1111-8GCC, L1110-7GCC and L1101-8GCC. Download the Modern Jeweler palladium wedding band editorial feature.